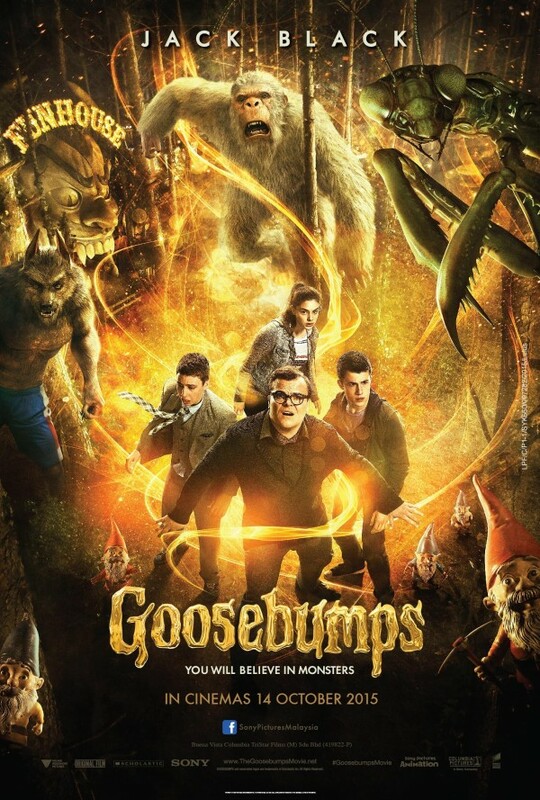 Goosebumps is based on the Goosebumps books by R. L. Stine in which Jack Black plays the author. After a new neighbour, Zach, visits the house the monsters trapped inside the Goosebumps books are released into the town causing chaos. It’s up to Stine, Zach, Stine’s daughter and their friend to trap the monsters back inside the books. The film doesn’t take itself too seriously and plays on a lot of clichés and tropes. It’s one of those films you go to see just for a bit of fun. There are a lot of different monsters released from the books including the Abominable Snowman, a werewolf, and a giant stick insect thing. The main villain is Sappy, but I’m not going to say too much about that as they don’t give it away in the trailers, but he was a really creepy villain (also played by Jack Black). The acting wasn’t spectacular though not exactly bad, but this isn’t the kind of film you watch for amazing acting, it’s the kind of film you watch to be entertained and I was entertained. It was funny to see Jack Black play a serious character whose humour comes from his seriousness. There was plenty of action and a few twists that worked well and although the beginning was a little cliché and predictable, later on the twists managed to surprise me. Overall it was an entertaining film. Would highly recommend if you want to watch something that’s just a bit of fun. I wasn’t sure if this film would be my sort of thing as I wasn’t a fan of McCarthy’s Bridesmaids (though I haven’t seen any of her other films) but being a massive Miranda fan thought I would check it out if only to see Miranda Hart on the big screen. In Spy McCarthy’s character, the deskbound CIA analyst, has to head out into the field when their field agents covers are blown and prevent the sale of a nuclear weapon. A lot of the time comedy films are chuckle-worthy but not laugh-out-loud-worthy. This film was absolutely hilarious though and at times I couldn’t stop laughing. It was thoroughly entertaining but it also had a great plot to carry it as well. It was pretty fast paced and there wasn’t a dull moment at all. It was so packed full of action and laughs that I want to see it again! The digs at classic spy films such as James Bond are great too. The acting was excellent. McCarthy was very funny obviously and Miranda Hart was great too. At times I thought Melissa McCarthy was a bit over the top though in the delivery of a couple of her funny lines and the use of the f word was a bit over the top too which is why I docked a 0.5 off my rating but for the most part it was very funny. From the sounds of it she plays a pretty similar role to previous things she has done but I haven’t really seen any of her other films so I can’t judge on that. The big surprise though was Jason Statham who was amazing. Typically I associate him with action films in which he plays a serious/dark character so I was quite surprised to find he would be in a comedy film. He was great at it though, his character was so funny and possibly my favourite character of the lot. This is another short review as I can’t think what else to say because I loved it so much! It really was excellent and full of laughs. Highly recommended!